Digital signs can be found in both public and private environments, including Retail Stores, Hotels, Restaurants, Hospitals, Schools and Corporate Buildings, amongst other locations. Advertising using digital signage is a form of out of home advertising which using video content, advertisements, and/or messages may be displayed on digital signs with a common goal of delivering targeted messages, to specific locations and/or consumers, at specific times. This is often called "digital out of home" advertising. The new transparent display creates a see-through display for interactive and attractive digital signage option. It can offer a host of solutions for businesses looking to engage with customers, with table-top or kiosks providing the perfect location. Transparent digital signage is the future of shop window advertising, allowing the user to update advertisements and window displays almost instantly without even entering the window display itself. There are many different Digital Signage techniques available to suit all needs. 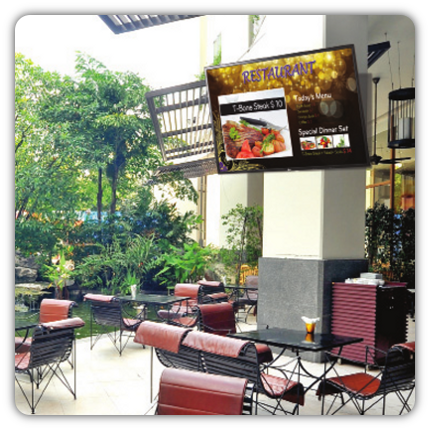 Display images of dishes available to your guests\customers using digital signage. Relay up to date pricing and nutritional information of available dishes on your menu. Used in Hotels, Shops or Restaurants to instantly update pricing, currency information or special offers.... The results are limitless. Can be used for large projects where a standard size screen isn't sufficient, also used as large screens to view social or sporting events, as well as advertising.